Well Christmas is barreling ahead, are you ready? I’m not ready yet, but I am working on it. Yesterday was my husbands’ birthday. I grabbed a cake on my way home from work last night so we could at least recognize his day with a birthday cake and I made him a nice dinner. I think he liked everything. Next up, our 22nd Anniversary, followed by MY birthday, Christmas and then my sister-in-law and my great nephew’s birthdays. Phew, I’m exhausted just writing all this! I used a retired stamp set for the sentiment because I just love the scripting of the font. I think it’s so pretty. I also love the dark Blackberry Bliss ink with the Basic Black ink. I just seems so majestic to me, hence why I’m calling it Purple Majesty. Yeah. I know…not too creative but it fits. This is a really easy card to re-create, I used the Lovely as a Tree set, Blackberry Bliss cardstock of the card base, a layer of Basic Black and stamped the image onto Whisper White cardstock using the new Basic Black Archival ink. 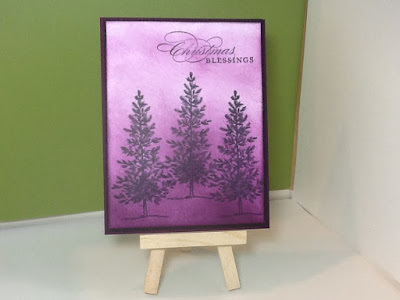 I then sponged Blackberry Bliss ink starting at the bottom, working my way up, over the stamped image. That helped me get a heavier color on the bottom and gradually lighten as I worked my way up. So that’s my card for today. I hope you like it. Thank you for stopping by, I really appreciate it. Please feel free to leave me any comments in the comments section below.